Name Cain at Onomast. What does name Cain mean? Meaning, origin, translation, rating, popularity, code, gender and comments of the name Cain. 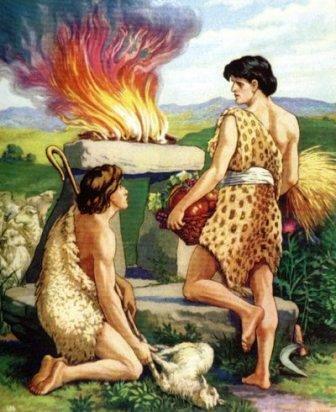 Hebrew given name (קין) meaning - "acquired"
Сain was a crop farmer and his younger brother Abel is a shepherd. Cain is portrayed as sinful, committing the first murder by killing his brother, after God has rejected his offerings of produce but accepted the animal sacrifices brought by Abel. The oldest known copy of the Biblical narration is from the 1st century Dead Sea Scrolls. Cain and Abel also appear in a number of other texts, and the story is the subject of various interpretations. Abel, the first murder victim, is sometimes seen as the first martyr; while Cain, the first murderer, is sometimes seen as an ancestor of evil. A few scholars suggest the pericope may have been based on a Sumerian story representing the conflict between nomadic shepherds and settled farmers. Others think that it may refer to the days in which agriculture began to replace the ways of the hunter-gatherer.